Keisha Greaves was inspired by her own sudden diagnosis of muscular dystrophy. 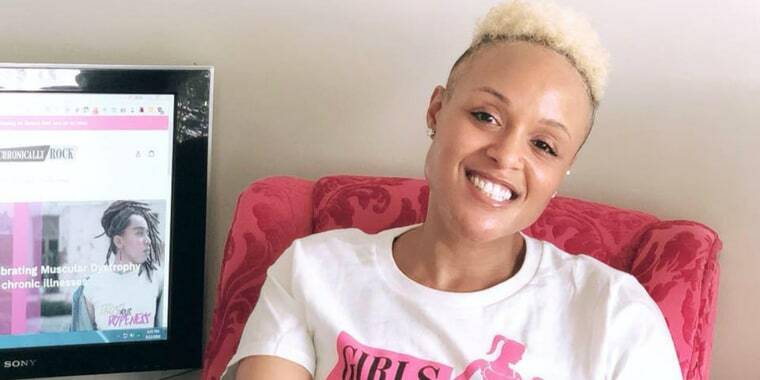 Greaves had already received her bachelor’s degree in fashion design and merchandising and was pursuing a master’s degree in business when she started to notice symptoms of her muscular dystrophy in 2009. “During graduate school, my leg started to give out on me suddenly," she said. "I would fall to the ground and couldn't pick myself back up." The grad student also started to experience trouble lifting her right arm up all the way. “At first, I thought I may just need to go on a diet, but in the back of my mind I had a feeling that it was something more serious,” she said. After seeing several specialists and undergoing multiple tests, Greaves received the news: She had limb-girdle muscular dystrophy, a form of the disease that affects the limbs of the shoulders all the way down to the legs. After learning about her condition and hearing that it would progressively worsen, Greaves slowly began to envision her future. “I started wondering how long I would live, when I would need a wheelchair and what my life would look like from now on," she said. Rather than succumb to her stressful thoughts, Greaves decided to take action instead. After researching her condition, she discovered that eating healthy and exercising would help, so she joined Weight Watchers with her cousin and lost over 36 pounds. And she's determined to keep up her healthy habits. Once she crafted a catchy name for her brand, Greaves took to Etsy to launch her first products. One year and a brand-new logo later, Greaves took her company a step further and created the Girls Chronically Rock website. And the reaction has been pretty amazing. “I get so many people reaching out saying, ‘Wow, I know someone that has muscular dystrophy,’ or ‘I also have a chronic illness, I know what you go through.’ Just to hear those inspiring words from others about my brand and my different blog posts that I write makes me feel so good,” the 32-year-old said. Greaves recently added baseball caps and metal cuff bracelets to her collection, and plans to continue expanding the line in the future. She also hopes to design an adaptive clothing line one day. “It’s so hard for people with disabilities to get dressed on a regular basis, so I want to create a line to make it easier,” Greaves said. “Also, it takes so much time to put on shoes and socks, so I want something easier for people with disabilities to put on, but also still fashionable at the same time." In the meantime, Greaves is just trying to find the right balance between running her business, working part time as a merchandise coordinator for another company and, most importantly, staying healthy. Five years after she was first diagnosed, Greaves and her doctors are still trying to determine exactly which type of limb-girdle muscular dystrophy she has, and she gets regular echocardiogram tests to monitor her heart. But the young fashion designer is determined not to let her disability slow down her dreams. “To be doing something like this to help inspire others makes me feel great," Greaves said. "I have plans for so many more projects under the Girls Chronically Rock umbrella, and I can’t wait until all of them come to life."